Erin S. Baker, a bioanalytical chemist at PNNL, is one of six winners of the Rising Star award, bestowed by the Women Chemists Committee of the American Chemical Society (ACS). The announcement was made this week. Every year since 2011, the committee has chosen up to 10 exceptional early- to midcareer women chemists for this national honor. "It was pretty much a shock," said Baker of getting the award, which is intended to promote the retention of women in science. "You figure you go into this big pool (after getting nominated) and then just get lost." Part of what makes it so flattering, she said, is that it acknowledges practitioners from all the specialties in chemistry - physical, biological, analytic, organic, inorganic, and more. And that its recipients are from everywhere: industry, academe, and from labs like her own. Baker joined PNNL - one of 10 national laboratories administered by the U.S. Department of Energy (DOE) Office of Science - as a post-doc in 2006. Today she is a Senior Research Scientist in the Biological Sciences Division at the laboratory's Earth & Biological Sciences Directorate. Her specialty is studying biological systems by using ion mobility spectrometry in conjunction with mass spectrometry, an investigative specialty known as IMS-MS. Separating and identifying ions - charged atoms or molecules - helps uncover the structure and function of the macromolecules upon which life depends, including proteins, lipids, and carbohydrates. The award reflects the importance of the human and environmental health research she is part of at a collaboration-driven national laboratory, said Baker, and how much it advances science and helps people. "I'm not necessarily great, but the combination of the amazing people I work with at PNNL and world-class research projects really make me look good." Baker - who perhaps deserves an advanced degree in modesty - has a Ph.D. in Chemistry (with a specialty in physical chemistry) from the University of California, Santa Barbara. She earned her B.S. in Chemistry (with a minor in Mathematics) at Montana State University, Bozeman. Baker started out in pre-med because she was not sure which science she would major in. Biology was driven by hypotheses that might take years to prove, she said, so chemistry ultimately got most of her attention. "You can prove things faster." Bozeman is not far from her family home in central Montana, where she grew up on a cattle ranch. Baker was inspired to study chemistry when arsenic and cyanide pollution in area streams was linked to a local gold mine. She praised PNNL for its access to instruments at the DOE national science user facility on campus, the Environmental Molecular Sciences Laboratory (EMSL). Baker has an office there and spends half her time in a lab coat and safety glasses. "We have a collection of instruments no one else has in the world," she said. "This frees you to do novel research." 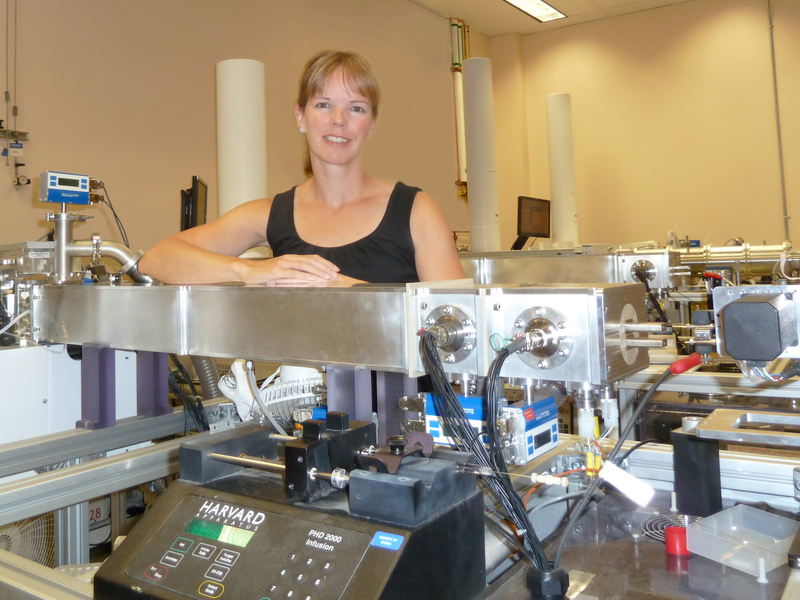 Much of her current work involves developing new technologies for making ion separations faster and more sensitive, with instruments that are increasingly compact. One is called the Structures for Lossless Ion Manipulations (SLIM) module. In the near future her projects will involve using her skills, along with PNNL's rare combinations of instruments, to explore the microbiome of the human gut as well as potential toxins in soil and in the foods we eat. Baker co-authored two recent review articles, in Nature Microbiology and Nature Protocols, outlining emerging microbiome technologies and the remaining technical challenges. ACS calls the Rising Star award "a distinct honor of professional accomplishment." Baker's cohort of six winners will present highlights of their work at an April 3, 2017 award symposium in San Francisco. The occasion marks the 253rd national meeting of the ACS, a nonprofit organization with more than 156,000 members. It was founded in 1876, then reincorporated and chartered by the U.S. Congress in 1937. Baker is still thinking about her ACS awards presentation, which - after all - is nearly six months away. But she is certain her 14-year experience with IMS-MS technology will be a big part of it. "Instruments will connect everything," said Baker of her coming talk. And she is sure to call out a few examples of how her research has helped cast light on science related to health and the environment. "Awards like this," said Baker, "really show how important the work is that we do at the national laboratories." • Rebecca Abergel, Ph.D., Staff Scientist in the Chemical Sciences Division Lawrence Berkeley National Laboratory.